Lying in bed just after 4.30 am and could hear a "beep" shut eyes start to drift off "beep". Half awake thinking that sounds like a smoke alarm "beep", can't be all the batteries were changed last week "beep". 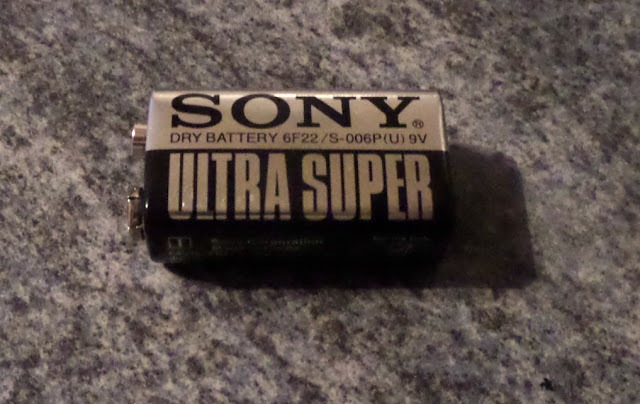 So I got up and stood on the landing till I worked out which one it was, fetched a chair to stand on and removed the battery. Brand new battery was about dead. So much for being safe and changing them once a year. A cold start to the day. 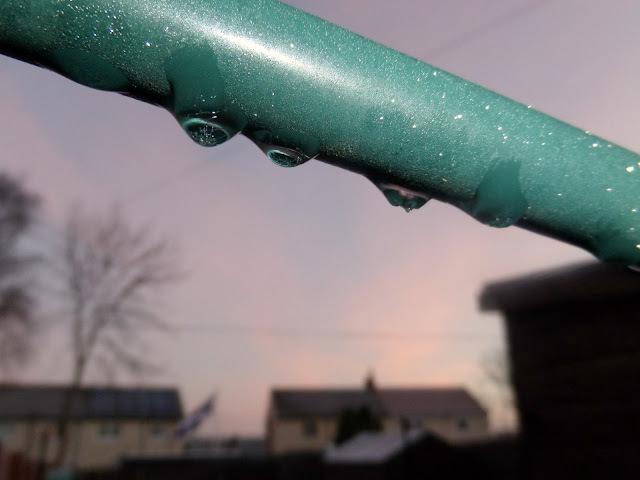 Spotted the frozen drips on the broken greenhouse frame when I went to let the dog out. As you do when it is freezing cold and half dark you whip out your camera. One of the draw backs of having a dog and living near muddy fields, she trots grubby footprints all over the place and shakes her mud onto the cupboard doors as well, floor and doors are wiped nearly every day. Luckily she is small enough to lift into the sink and rinse off. A walk along the beach with hubby and Lilly. Was chilly and windy but it blew the cobwebs away. Sun was low and creating silhouettes. 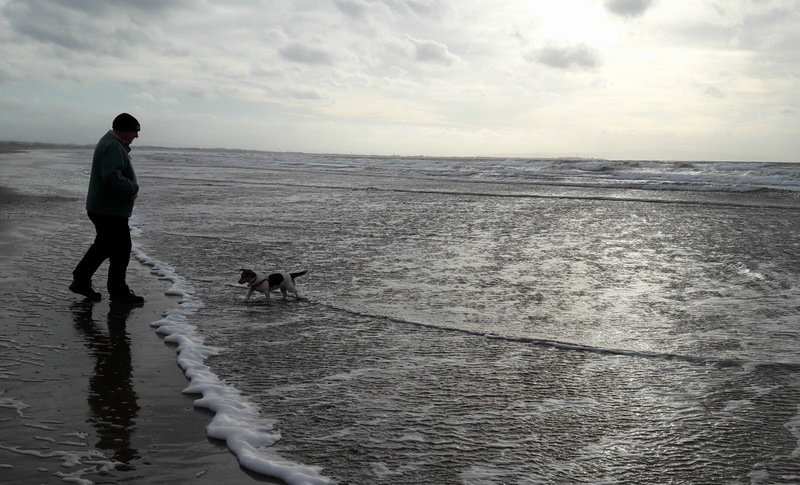 The tide was going out but every so often a big wave would come further in so a few times Lilly got her feet wet. We were on the beach for well over an hour. My talking about quilting at work has got a couple of the others interested so Lynn bought herself the items she needed and has joined me. She has done well, made a couple of make up bags with waterproof lining and zips on and is currently working on oven gloves that she bought heat proof wadding for. We have decided once a month to meet up at each others houses and have a sewing session and a natter. So I went along to hers today and worked on a new diamond shaped creation. Have actually been spending some time getting to know my sewing machine, for years all the poor thing has done is sewn in a straight line. It actually has 22 different stitches and various features that I will be trying out sometime soon. Managed my three workouts this week, been ringing the changes again. Finding that the one I was enjoying are just to sore on the old crunchy knees. My head might still be 29 but my knees are not. This week on the quilting front I have finished last weeks. Another learning curve, worked out it is easier to quilt the triangles than the squares, less stopping and starting. Have made myself a pin cushion and been experimenting with a diamond shape. At the moment this has no plans to become anything, will go into my pile and one day it may be added to a bigger piece of work. Made the most of working in an ophthalmology ward at the hospital at the weekend. On Saturday my eye was a bit gunky during the day and on Sunday it got redder and sorer during my shift. So I asked the on call doctor to have a look for me. Confirmed my bacterial conjunctivas was back and gave me drops for during the day and ointment for over night. She also took some swabs to send away for testing. Then told me I should not be at work, because of where I work and the risk of infection, but by then it was only ten minutes before the end of my shift anyway. Just meant I could not do my overtime shift. Could not sleep. Woke at 4am and decided at 5am to get up. 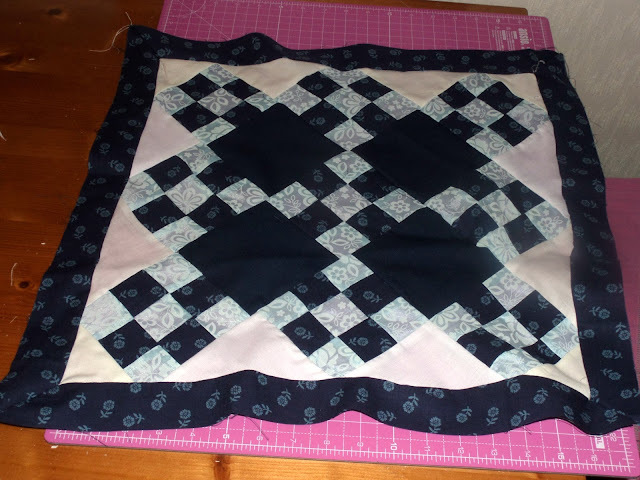 Did some sewing, made my cross out of squares and triangles with a diamond in the middle and joined my four squares together from last week. 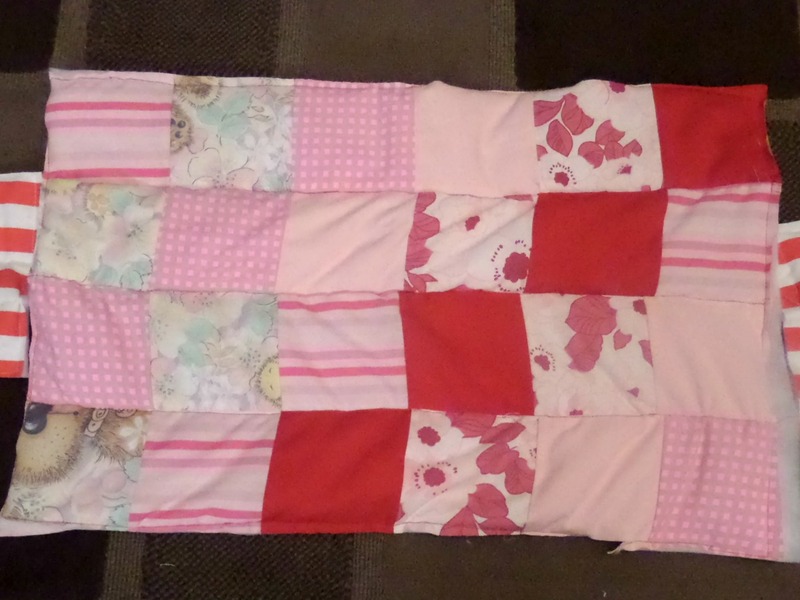 Now just need to wad it, back it and quilt it. Scuse the wall hanging sticking out of it but I pinned it to that to get photos. DD2 is down with Ziggy. She will be attending a family funeral with DD1 tomorrow. She tries really hard to turn herself over but cant quite get there. But she can turn herself round in circles. Her head stays in pretty much the one place and her feet and body go round in circles. Back to Homeopathy for my second appointment. She had concerns over how often my body is over reacting to food since I started and is reducing the dosage to see if that helps, if not it will be back to the allergy clinic. We went for a walk with the dog before I went and we found a sheep well and truly tangled in some brambles. Poor wee thing was lying on its side and I would say judging by the hollow it was lying in it had been kicking for hours. Poor wee thing was quite weak on our way back and only managed to wiggle its ear. 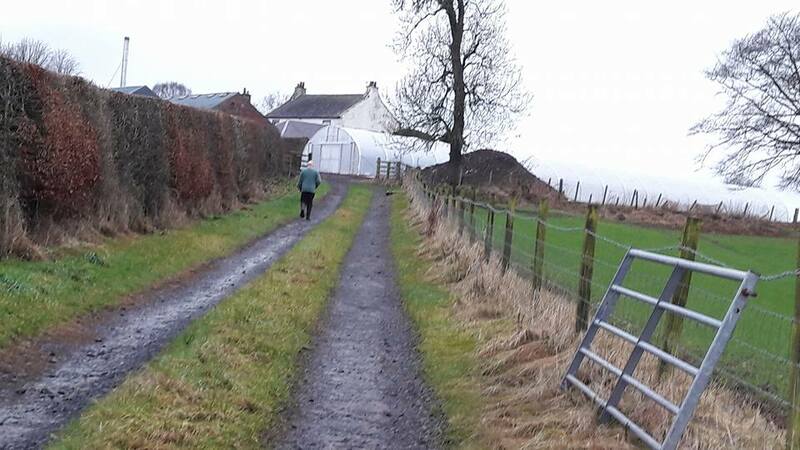 So hubby walked up to the farm to alert the farmer to its plight. Ziggy managed to roll herself from her back to her front tonight twice, so I shot a video. Been having fun with my new addictive hobby this week. 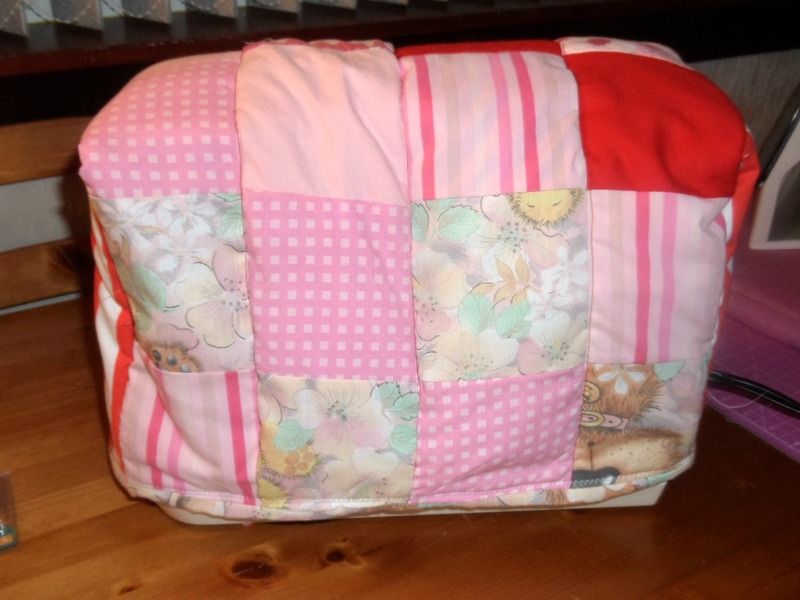 Decided to make myself a new cover for my sewing machine, well seems a logical first finished project. It was a learning curve and I did a blog post on it here. 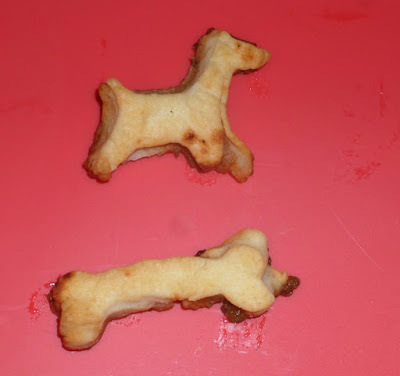 As part of my Christmas the grandchildren bought me a recipe book of dog biscuits along with two shapes to cut them with, I have to admit to not having had time to make any yet. Well I went upstairs to do my third workout this week and left the tea ready to go in the oven. I came down and hubby had been cutting bone and dog shaped pieces out of the pastry. So I cooked them on top of the meat anyway. Look every tub has a lid and every lid has a tub, I doubt it will last long but at least when I go for a tub for the next few days I will manage a matching pair. 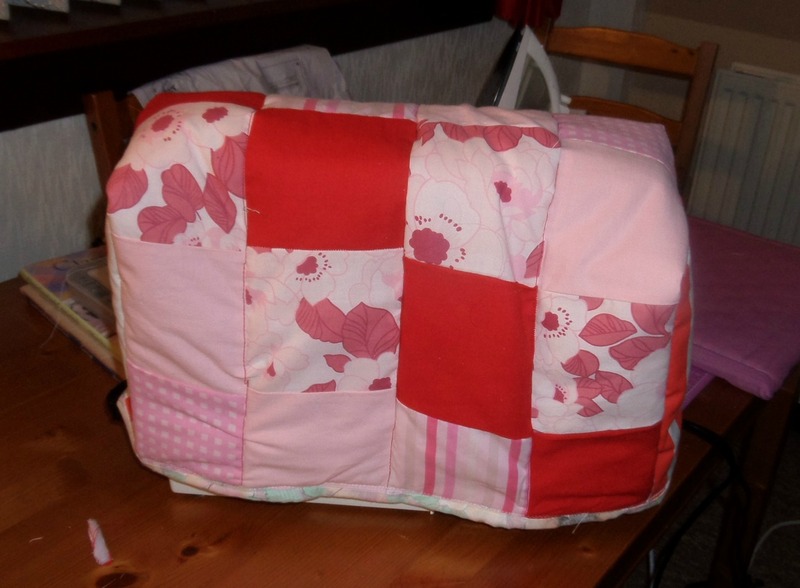 Well I have done it, finished the first completed quilting item I have made. Previous to this I have made two fronts for two other projects I have yet to finish, but one down many more to go. I found an online tutorial for a sewing machine cover a while ago and decide this was going to be my first real learning curve. So having been reading various online blogs and tutorials, watching my way through many dozen youtube videos and and learning a lot of the terminology it was time to have a go. Have to admit to buying sheets, quilt covers and curtains out of charity shops as a way of getting large quantities of material on the cheap to use to practise with. So what have I learnt from doing this project? that nothing is ever going to be perfect. you use a lot more thread than I would have thought. the proper tool for each job makes the cutting and sewing quicker and simpler. there are easier ways to make 9 square and triangles than what you would see as the easier ways with hint and tip short cuts. ( shame I had cut out a few hundred shapes before I discovered this but the shapes that are cut will still be used. 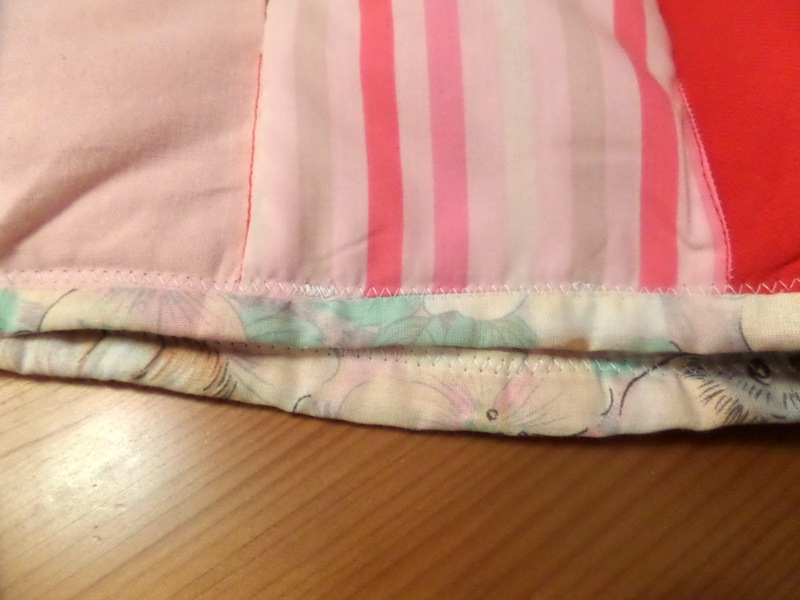 that despite pinning my material doing long runs of ditching causes some creases on the backing material so in future I will sew four corners and the middle before I move on. I decided to make something useful now that my sewing machine is sitting out on the table all day every day I thought I would make it look pretty. 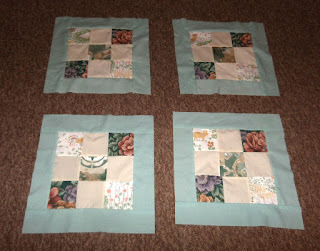 the squares padded ready to shape. 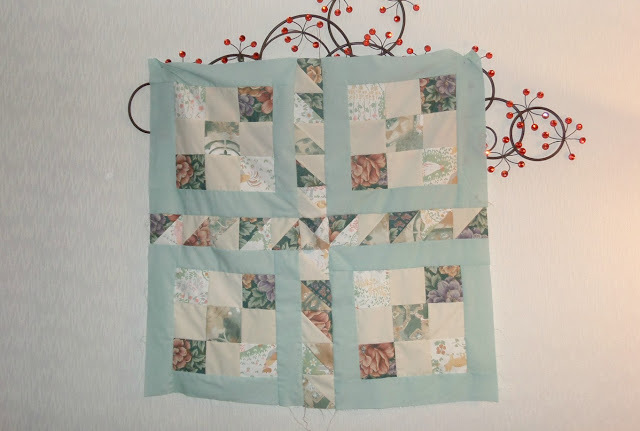 Sadly part of the idea for this project was to practice the quilting bit, what they call filling the ditches ( basically you sew through the layers along all the seams you have on the top piece). But I did not appreciate how much thread it takes and ran put of red once I had done the up and down seams and did not have enough for across. I used a strip of contrast material to make the binding round the edge. It looks the part and I am happy with the result. Labels: quilting, sewing machine cover. I don't join in with this every week so my numbering will be different than others, don't worry about it. DD1 phoned to say the children were excited by the smattering of snow we had. They wanted to go out and play in it, so she decided instead of taking them the park, think mud, dog poo etc to play in it she would wander up to my bit with them instead and let them play on the way up. This is the point that Dinky spotted Granddad shouting her out of the top landing window as we were looking for them coming up the street. They stayed and played for a fun nearly two hours before heading back down the road. One of the books I ordered from Amazon came through. At the moment this one is beyond me But it has ideas in that I want to aim at to make quilts for the youngest two grandchildren for Christmas. Plenty of time to get to that level as I am starting with the basics. The book cost me all of five pence from an American book shop so too good a price to not invest it even though I do not need it just yet. But I felt time I was at the stage for it I may not find it as cheap again. SIL is back and work and Bob is back at gymnastics so back on the gymnastics run. So I went into the library across the road took my laptop and did some blog and Instagram commenting. Home and put jacket potatoes in the microwave for tea and did a 25 minute work out. 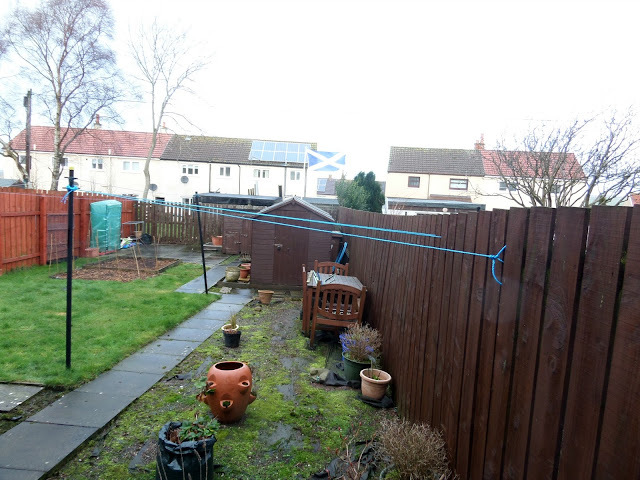 It has been rather wet here meaning everywhere is muddy and there is no where to take the dog she can get a run off of her lead that does not involve fields. I would not say she was spoilt ( much anyway....lol) so after her walk she has been dumped in the kitchen sink to rinse her clean, hubby then dries her with a towel and the hair dryer. 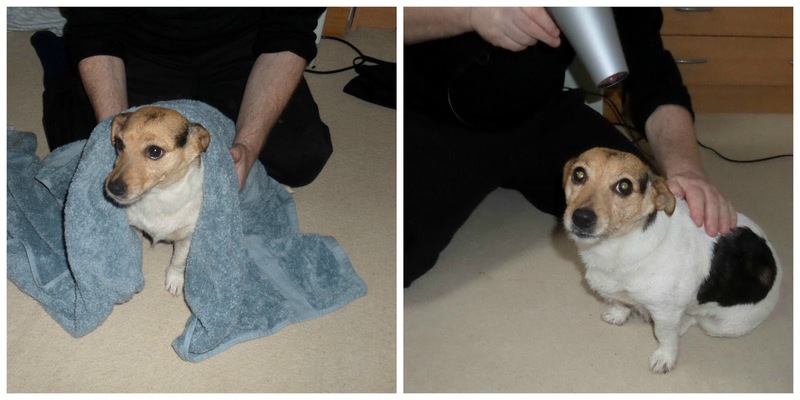 She was scared of the hair dryer when we first got her but now she is ok about it. 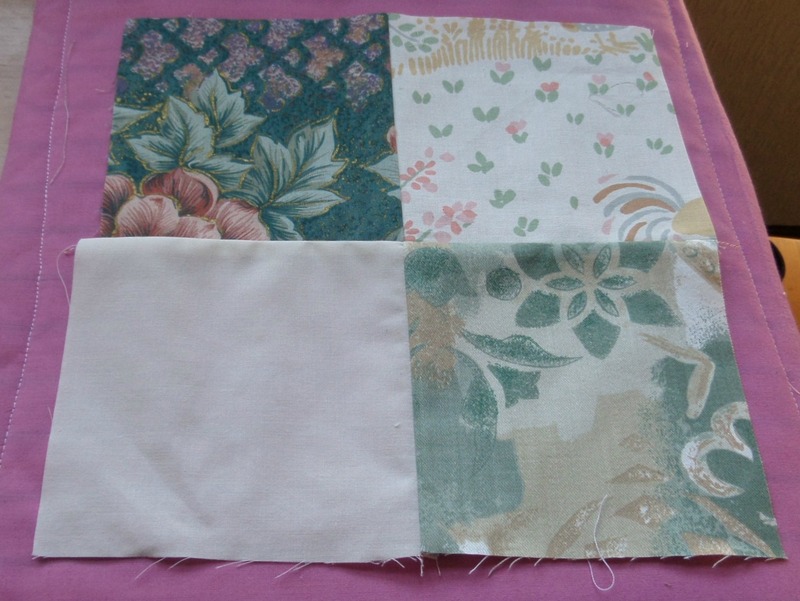 Did some sewing, quite pleased with how the quilting is going, and managed a workout while tea was cooking. 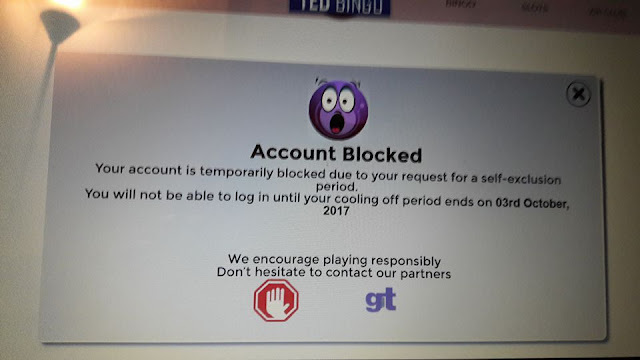 This weaning myself of the bingo sites on the computer is good for the house, I cleared out all the bedroom drawers and my big kitchen cupboard. Which is also good for me psychologically as I feel much better doing something constructive. scarf Sorry just a bit of light hearted fun. 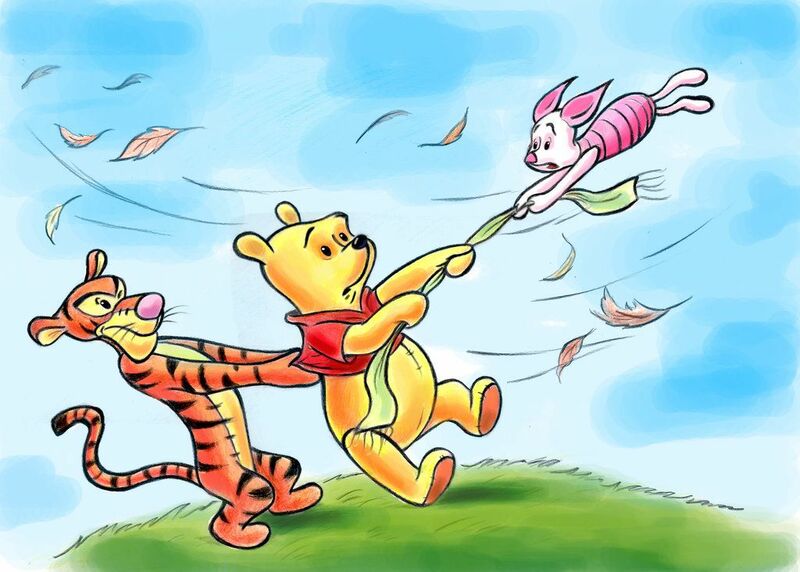 It was far to windy for DD1 to try and walk the twins safely along the main road while battling with a pram to take them to nursery, so I went down and took them and then picked them back up. I was leaving the village around that time to do some shopping anyway. It was the sort of day we thought we may lose the fence so hubby tied it to the clothes pole, then we thought it may get pulled over but they both survived this storm. Thankfully we did not get the snow they predicted for us but it was not a nice day. Today was a snowy day. 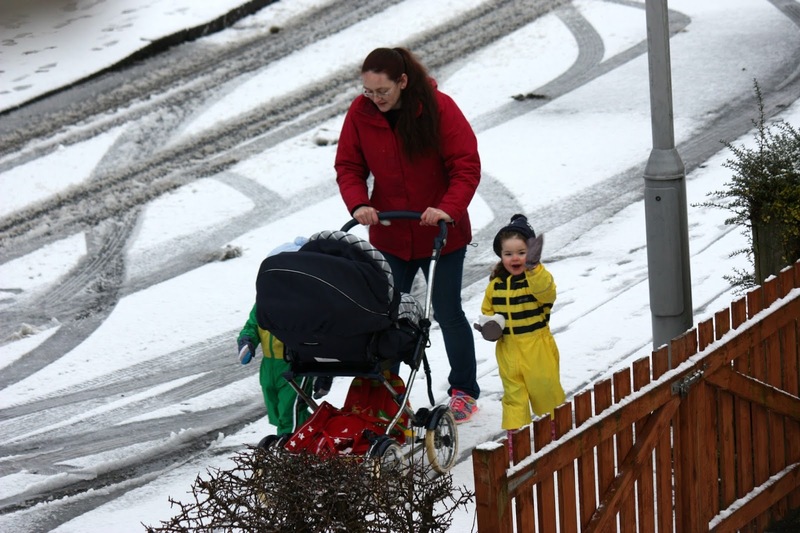 DD1 brought the children up for a visit as an excuse for them to go out and play in the snow. They played with the jigsaw and lotto game they got for Christmas. Then as I was sat on the floor the two of them sat on my legs and we played all fall down,basically they threw themselves backwards, lots of giggles were had especially when I tickled their tickley bits. Slightly cheating here as hubby took the photo but don't tell anybody. Every Jan hubby changes the batteries in the smoke detectors, no chance of them running out then. Did my third workout of the week. Been doing HIIT this week. I have been putting in an hour or more of sewing every day this week. Really enjoying doing it, and like the cross stitching I find it pleasantly relaxing. I made these four and have framed them with the green. I am thinking I will make a plus sign shape out of triangles and then patterned squares round the edge from the same patterns to join the four of them together Hope to share that with you next week. Sweet Dreams - I wish!! There is nothing most of us appreciate more than a good nights sleep. I, like many others, do not function too well without my eight hours of sleep. Sadly there are times in our life when things do not always go to plan and we do not get our sweet dreams. I remember being so tired after my babies were born that I walked around like a zombie for a number of weeks, too tired to fall asleep, so tired all you want to do is cry. Last month I had an horrendous cold, I could not sleep. I spent nearly two weeks propped up on four pillows coughing my head off unable to breathe. It makes for a long long night. There are times like that I wish I had an Adjustamatic bed, would be interesting to see how much less coughing I may have done in a bed that keeps you upright. I have to admit after trying for an hour every night I made my kindle my best friend. I read, I watched episodes on Netfix and Amazon Prime, as well as listening to audio books that I downloaded from the library. This did help to make the night more tolerable. Sadly from there it got worse, in week three of my cold I got bacterial conjunctivitis on top of everything else, this made my eyes so sore I could not read, I could not bear the light and I was too sore and uncomfortable to use my computer or watch episodes on the kindle. I also found by the end of two courses of both antibiotics and steroids that my restless legs were a problem again. 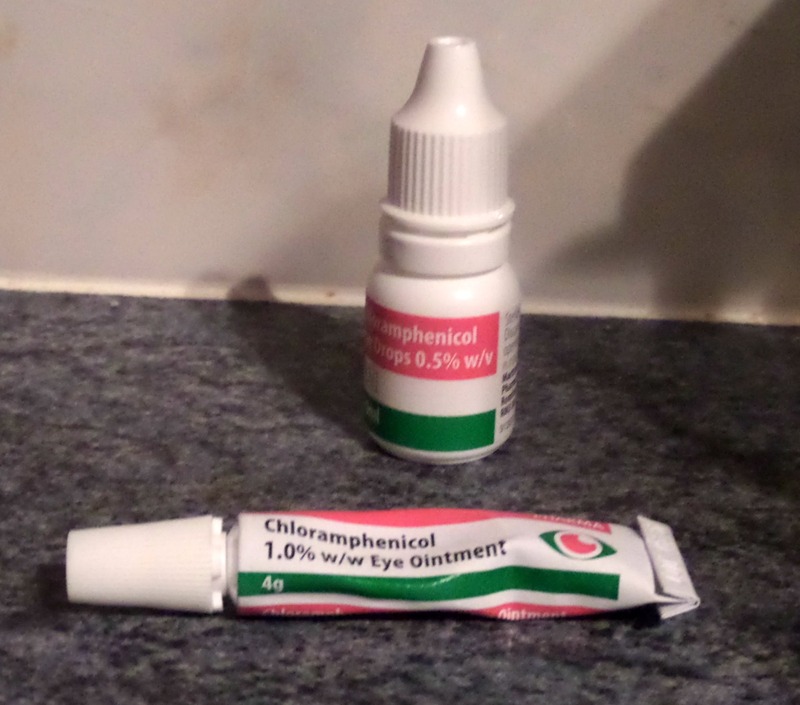 I had managed to get the problem under control with magnesium and a Vitamin B complex as recommended by my GP, but I guess the other medication messed with the balance, again a bed with a foot end that can be risen would help there as well. I am glad to say all these episodes were short lived but for many people it is not, there are various causes of insomnia. Sometimes this can be due to illness or pain but it could also be down to the way people sleep. There are varying theories on how warm your bedroom should be, whether you should have technology in your room, and many other thoughts about quilts and pillows. and have to say I was amazed at how much of it I actually do right. I sleep with two pillows and they recommend one so I fail there, but I cuddle a pillow when lying on my side and I also sleep with a pillow between my knees. As Meatloaf said two out of three ain't bad. How do you sleep with your pillows? Do you wake up refreshed or still tired? I think when it is a long term problem most of us would try anything for a good nights sleep. Well having done five years of this project I could not really stop now. I am not so much fed up with the project just life in general and this was reflecting in my effort that I put in last month.The knock on effect financially of me having four weeks off sick is not helping my frame of mind either, but nothing I can do about it so no point in letting it drag me down. So have taken the bull by the horns this week and made a few changes, some of these changes have made for pictures of the day this week. Welcome to 2017. I do not like purple or yellow jelly tots so decided to play daft with them. A walk round the fishery with Lilly. She just lives to get out and run, and the tail wags constantly. Love how she has grown in confidence and wanders away from us to explore. She was our best buy of last year and well worth every penny of the rescue fee. 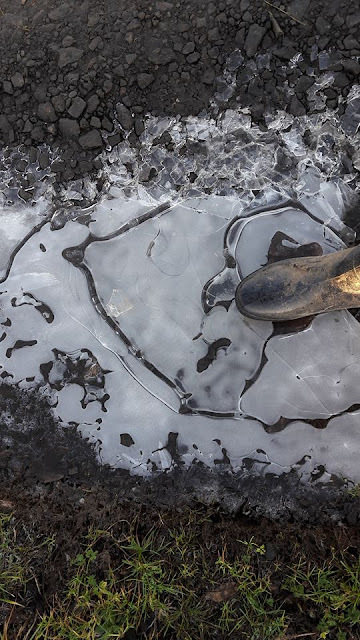 Have to say icy puddles are a bit like piles of leaves and bring out my inner child, I have to go and walk across the top of them and crack the ice. I also like to walk through snow that nobody else has disturbed. One of the things that has been annoying me is the time I have spent playing on various bingo sites. Don't get me wrong I do not spend much money, a maximum of £20 a month and if I win I draw my winnings out and then add them to another site and get a bonus to play with as well. At then end of the year I have won more than I have lost. But I have been spending a lot of time on them as they send you a text/email/phone call saying we have added free spins or a bonus to the account, so you go on and play and win a bit so do a few more spins etc and before you know it an hour has passed. So I decided this week to close them totally or some I could not close from my account I suspended them for up to five years. DD1 had to pick her mini bus up from the local garage today after its MOT. It is a two minute walk from her house but save her trailing the four children and having the hassle of strapping them into their car seats I said I would pop down and watch them. 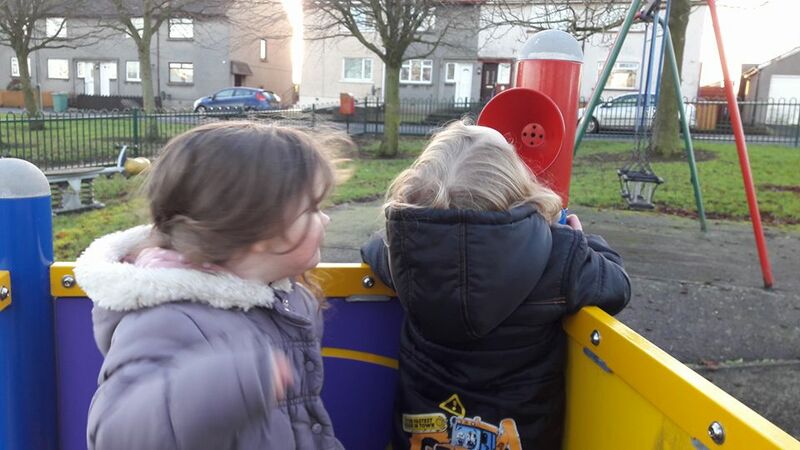 So as it was dry but cold we wrapped up and went to the park.Had to laugh the twins were running and I was chasing them and they were both busy looking behind them when Minky fell over, and Dunky promptly ran into him and tumbled over the top landing in the mud. The two of them laughed their heads off. One of the reasons I want to reclaim some of my time is to get back into doing some keep fit at least three nights a week. I was busy busy making Christmas presents for a lot of the tail end of the year, that combined with being ill for most of December I just got out of the habit. I did well last year having lost a stone and a half and while I have not put any back on in the last four months since I stopped doing any I want to lose the same again this year and so am determined to get back into doing it. So today I have had an hours walk with the dog, a half hour walk with the dog and a forty minute work out while tea was cooking. My second workout this week over and above the normal walking of the dog. Popped down to DD1 to pick up my amazon parcel. Walked in and Dinky ran over with a huge squeal of delight and gave me hugs and kisses. She then showed me the slices of satsuma she has had stored in her cardigan pocket since this morning. 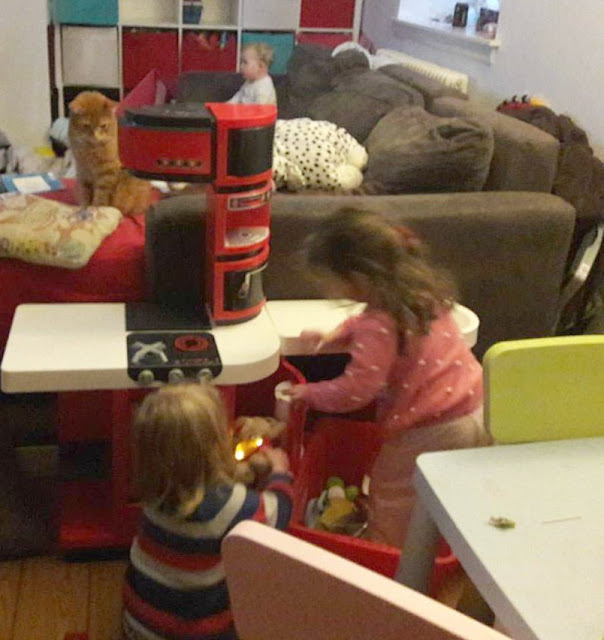 The two of them were having fun playing with the kitchen they got from Santa, they love it, great choice Santa. You can see Spud sat on the couch in the background, she was enjoying sing a long a Christmas songs from youtube. She did end up down on the floor jining in with playing with the kitchen. Managed my third work out of the week. When you are doing patchwork there is a large amount of pressing of seams to do. 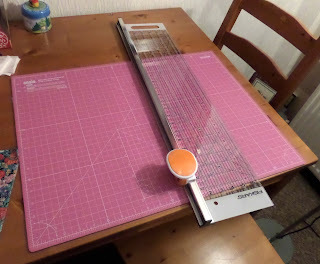 Rather than using the ironing board which would be in the way downstairs where I am doing my sewing or a nuisance to use upstairs I made a pressing pad. Have seen people using them on youtube tutorials but I was not keen on the price. So hubby found me an off cut of a piece of loft flooring. I measured up a length of wadding and stitched a cover on it. 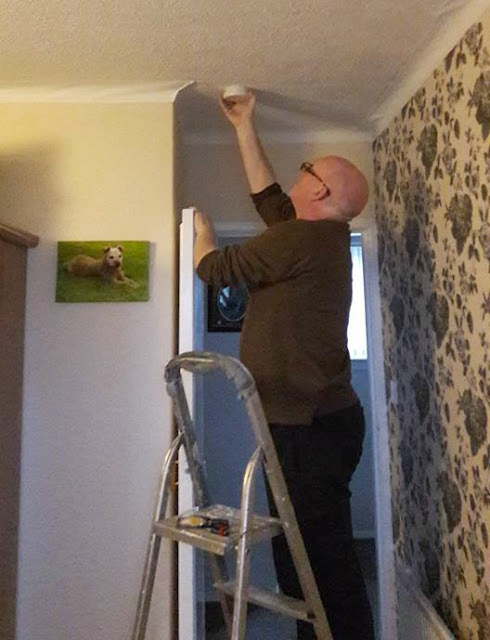 I then topped the piece of flooring with some tin foil which hubby taped to the back, I then folded the cover with the wadding inside round it and hubby stapled it on for me. 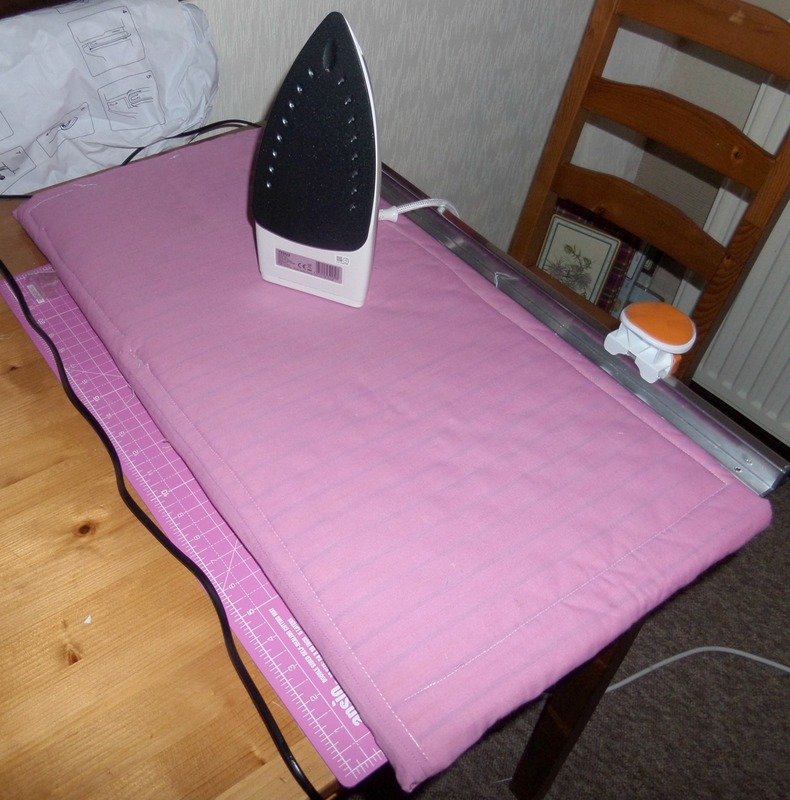 One ironing surface big enough for pressing on that will sit nicely on the table next to the sewing machine. 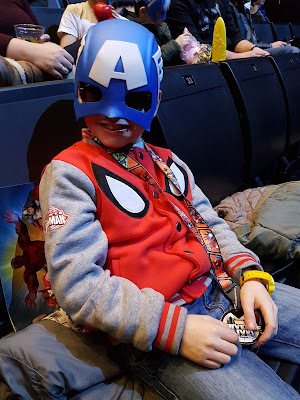 Hi everyone, it's Auntie H here to tell you all about our trip to see Marvel Universe Live! 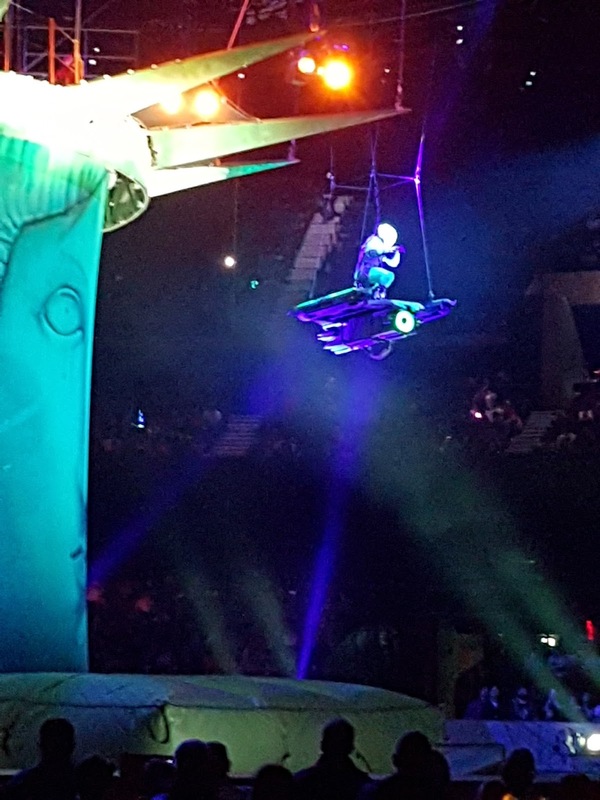 at the SSE Hydro in Glasgow last night. This was Bob's main Christmas gift from Uncle M and I this year. Background: For Christmas we used to always buy our nieces and nephews a selection box/sweeties of some sort. Now when you have a child like Bob it's a bit unfair for all of the others to receive chocolate etc and not him (bearing in mind it's difficult to get him sweeties that he doesn't already get on a regular basis as his choice is so limited), so early on the decision was made that in his household we would buy a toy for the children instead of junk food. However with such a large family the kids always end up with more toys than they could ever need. A couple of years ago we made the decision that we'd like to make memories with them instead of giving them material items and it has worked really well. We now try to do this for their birthdays too. As a result Bob has been to Treezone in Loch Lomond and faced his fear of heights, he participated in a Summer School week at the theatre (we saw such a difference in his confidence that his mum signed him up for regular classes), Fifi has been to Alton Towers for the weekend with myself, Uncle M and his family, she will also join the Tech Theatre class later this year and the twins will be joining a class at the theatre. We have also promised to take Bob and Fifi to Blackpool to see the illuminations when they turn back on later in the year. 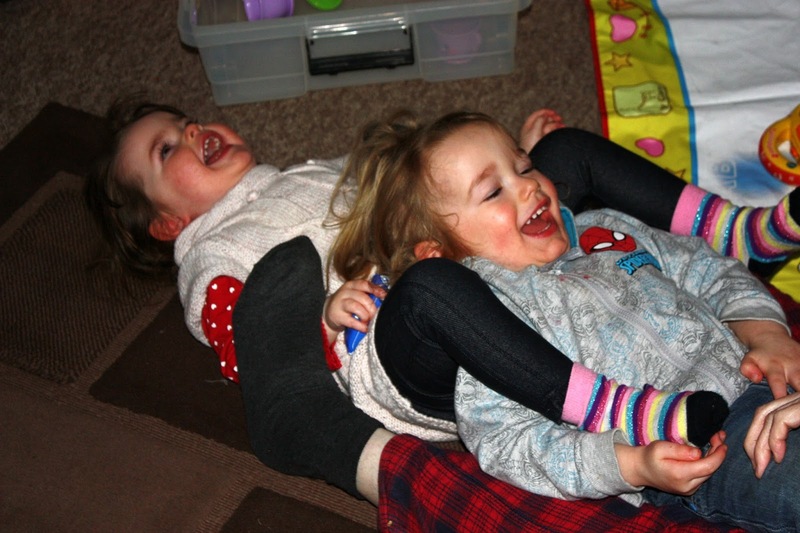 (The twins are just a little too young for a weekend trip away as yet) The kids always have a blast and we love being able to do this with them. Making memories that will last a lifetime is just amazing, we really are blessed. So, onto this years gift for Bob. 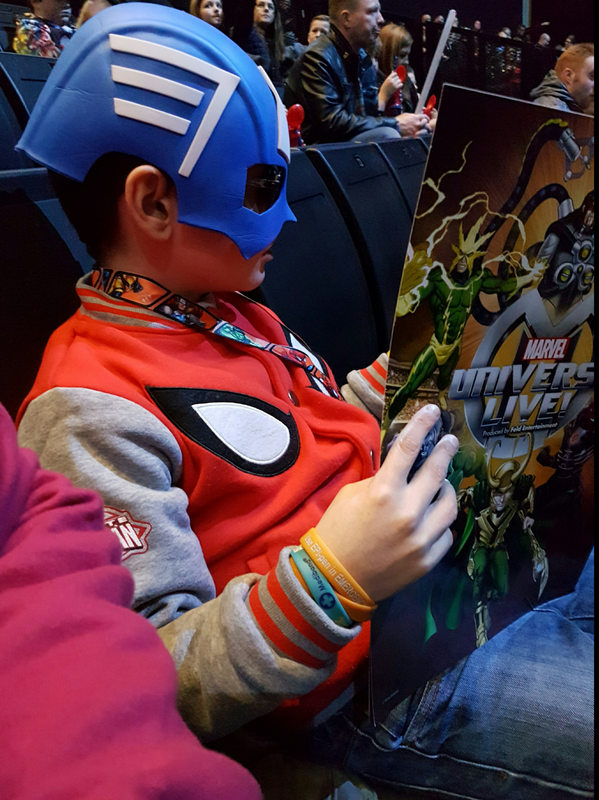 Now Bob, like most other 10 year olds I know, is mad about superheroes. He loves reading about them, watching them and used to be dressed up as them on a regular basis. When I saw Marvel Live advertised at the beginning of 2016 I knew I just had to get him tickets for his Christmas. I think it's fair to say it was a good choice, he had an absolute ball last night, the look of amazement on his face was brilliant. 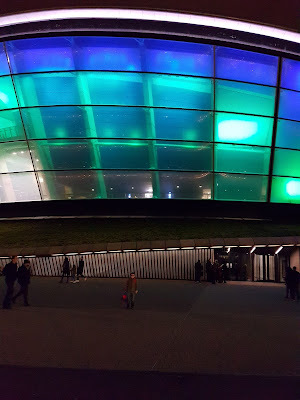 We arrived outside the Hydro around 5.40pm and doors opened at 6 so we went for a wander into the SECC where the Irn Bru Carnival is on. 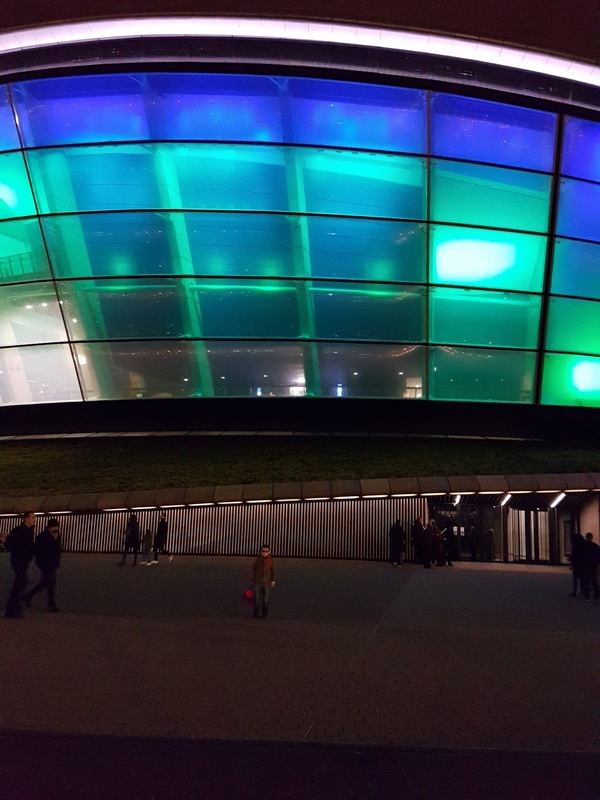 I got this picture of Bob outside the Hydro, I think you really get a feel for the scale of the place. After our wander we joined the fairly long queue that had formed. This went down really quickly as there were stewards directing people to 6 smaller queues where tickets were being scanned. When ours were scanned there was a problem, so we were asked to go to the information desk. On the way through the main doors of the building security guards check bags. We had Bob's emergency bag and a bag of snacks/juice for him. We hit a bit of a snag with Bob's Irn Bru as seemingly sealed bottles aren't allowed in the venue. They were providing cups to decant liquids into however we can't safely do this with Bob due to the potential for cross contamination (fine in the house when it is under our control but who knows who had handled those cups with potential allergens on their hands.) Uncle M took over and handled the situation brilliantly, explaining our reasoning calmly and firmly. The solution was to take the cap off the bottle and let Bob carry his open juice. We were then led to the Box Office where we were given new tickets, and to our pleasant surprise we had been upgraded to better seats. No reasoning was given however once in the arena I could see our original seats had been covered up with black material, I think the sightlines were perhaps not good enough to seat people there without having pre-warned them. We bought some candyfloss which came with a Captain America hat, however it turned out not to be Bob friendly as it had soy in it, so Bob got the hat and Uncle M quite happily munched the candyfloss. 5 minutes before the show started Jarvis announced a safety message. A nice touch, it got a few laughs when he introduced himself. The show itself was absolutely fantastic. Bob's jaw dropped the minute it started and I don't think it closed again until the end. The story-line was interesting and well performed. 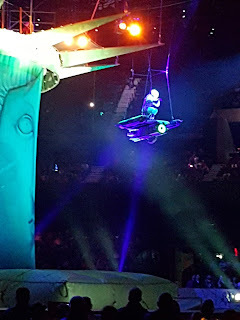 It was very entertaining and visually stimulating. Each half wasn't too long, around 30-40 minutes, which was great as there were lot of young children in the audience. The flying rig was top notch and extensive. It appeared to be mostly automated but some crew could still be spotted on top of the grid, I presume this was to check the carabiners, make sure there were no snags etc A lot of the time throughout the show the cast were clipping themselves on and off of the lines in order to be able to move freely for stunts. There were massive TV screens that formed part of the set and these could slide open and shut to allow other scenery to be brought on. They were also used to show video/animation for the show which was really cool. 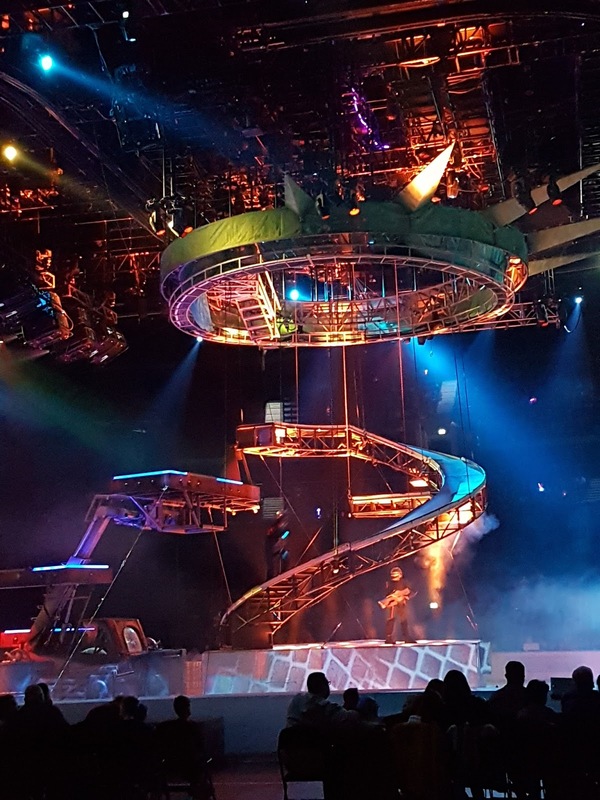 The set itself was brilliant, it was very cleverly designed to allow the crew to set and strike it quickly without distracting too much from the scenes being played out elsewhere. It was also quite intricate and I was impressed with how much of it was hidden in plain sight from the very beginning. 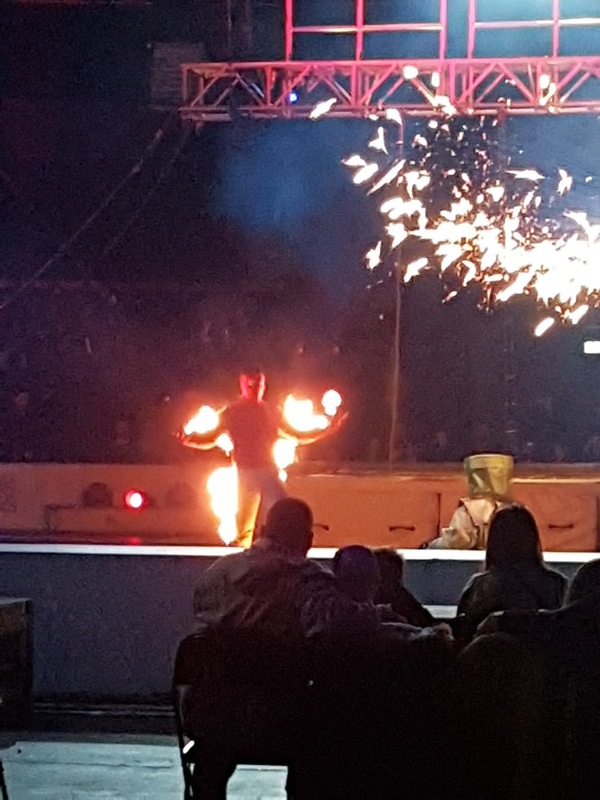 The lighting for the show was great, perfectly timed and well designed. I love a cool laser or two too! When you put all of this together with an excellent cast, brilliant costumes, awesome stunts (the motorcycles were particularly cool) and a well oiled stage crew it made for an excellent experience. I would highly recommend it to anyone who's even remotely interested in the Marvel Universe. Bob had a blast and was a very happy and tired boy by the end of the night. The photo on the left is Spiderman and Green Goblin, the right is Green Goblin on his glider. My new hobby for a new year. I love to be creative, not saying I am overly artistic but I take great pleasure in making presents for the grandchildren that money cannot buy. I have been into cross stitch, knitting and crocheting for a number of years and most of them have benefited from these skills. Fifi still has her Winnie the pooh cross stitch blanket I made her, and Bob has his with Humphreys corner on. A great way to mark their births as they contain their name, weight and date of birth as well as pictures and a rhyme. 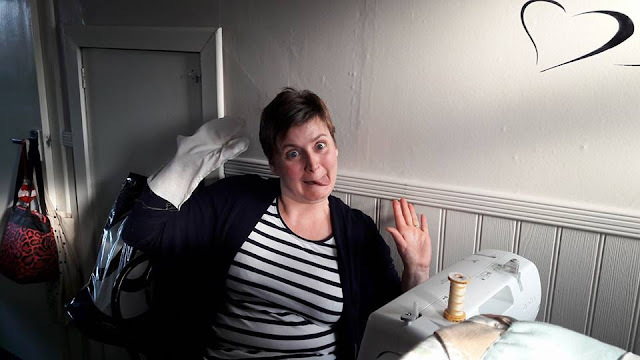 When I made Bob's one nearly eleven years ago I bought a sewing machine to allow me to quilt and then back it to cover all the cross stitch threads that little fingers may have got caught in. The machine generally lives in the loft as it is rarely used. 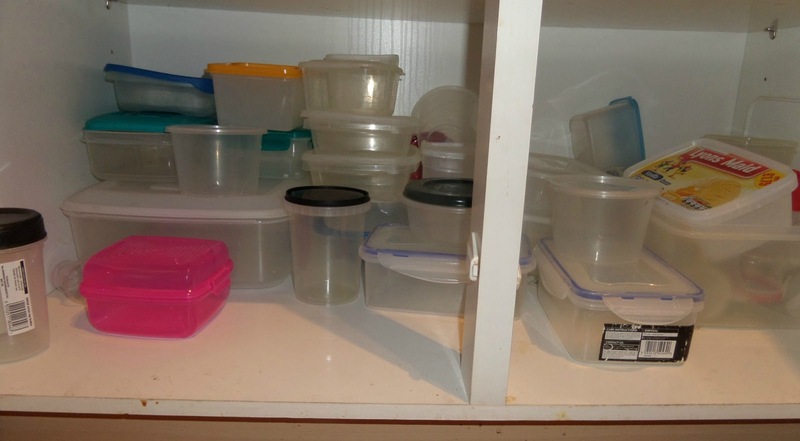 It comes out if there is a job to do and goes back in the box until next time there is a job to do. It came out back in September to allow me to finish baby Ziggy's blanket and then again last month to stitch the twins cross stitch blanket's. So I decided that my new hobby was going to use the machine that has barely paid for itself since I bought it all those years ago. 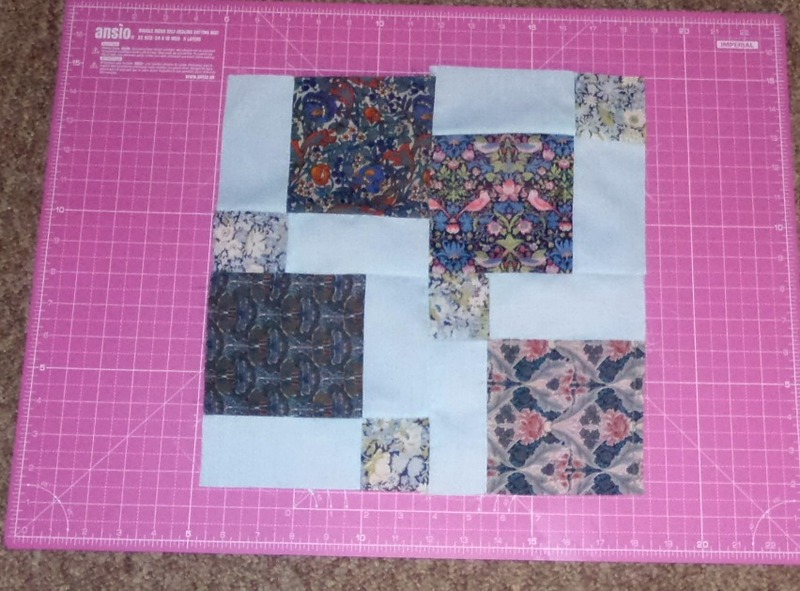 So I decided I was going to try patchwork and quilting. I received money for Christmas and I am always determined that this money does not get spent on the house but is spent on me as the givers intended. So having put thought into my new year hobby I bought myself some of the basics. Firstly I bought a cutting mat and a cutter. I decided I preferred this cutter to the rotary cutters ( think pizza cutter) as it looked easier to use. Also buying the rotary cutter you needed to buy shapes to use to cut round and I just preferred the simplicity of this item. The first task before you can sew anything is to cut your material into the shapes you require, at the moment I am sticking with squares for the ease of practise. I also invested in a 1/4 inch foot for my sewing machine as it is 1/4 inch hems you use on the shapes you are making. 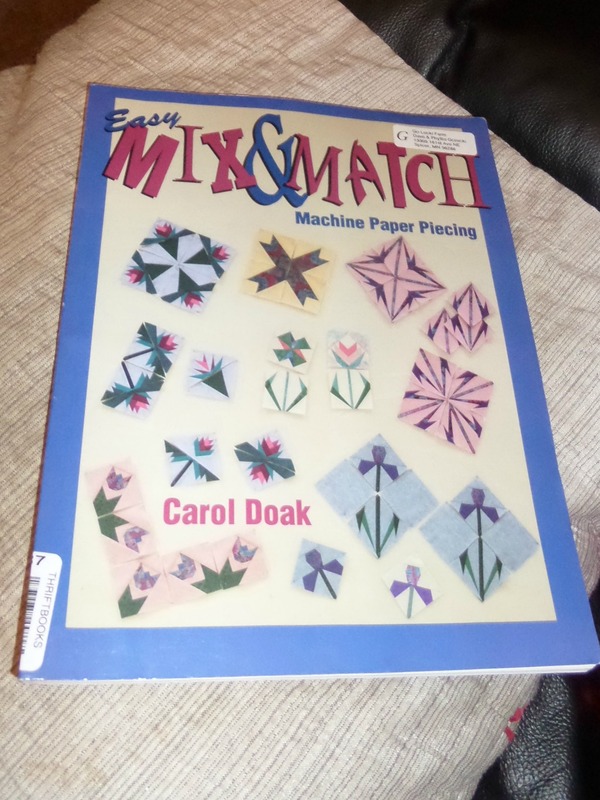 I have been looking in charity shops for a while and have picked up a lot of material in the form of curtains and quilt covers to use when I am practising, when I have picked up these items for a pound or two it seems silly to go and buy material by the meter to practise with. 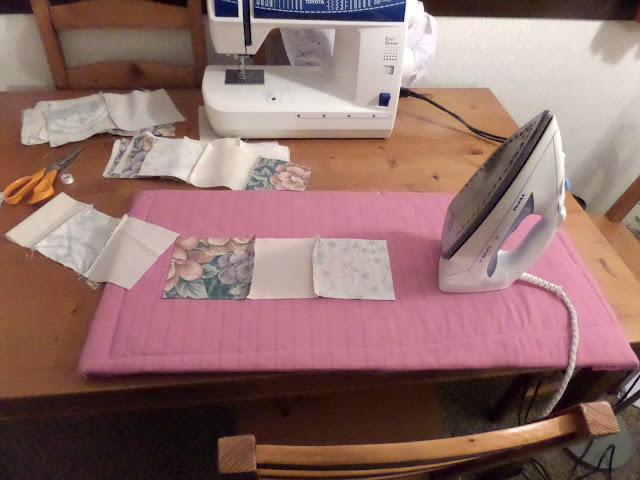 An important part of the sewing process is pressing the seams you sew before you finish joining the pieces together, I had seen that you could buy a heat mat type idea that you can use on your work station, in my case the dining room table, and I liked this idea as I do not have room for the ironing board near my table. Have to say I did not like the price overly much and so I made my own. So I got DH to get me a spare piece of loft flooring from out of the loft. I had a piece of wadding material which I trimmed to the same size as the flooring piece, I covered the wadding in material two inches bigger all round that the piece of flooring. I then covered the top of the flooring with tin foil, this was so that when I am using the steam iron to press the pieces of material the flooring is not absorbing the steam. 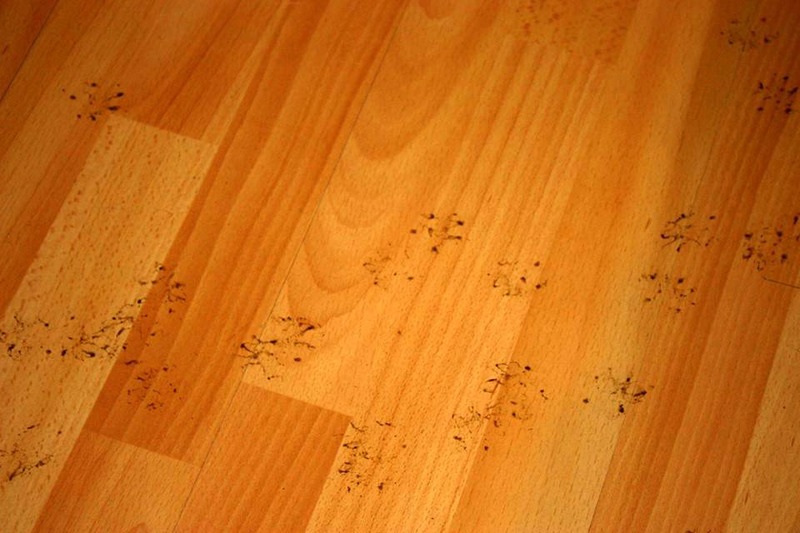 I then stapled the wadding and material to the flooring and covered the staples with elephant tape so it would not scratch. Viola I have one home made heat pad for no cost at all. Looks great and is perfectly functional. At the moment I have no set idea of what specifically I want to make, apart from items for the grandchildren. 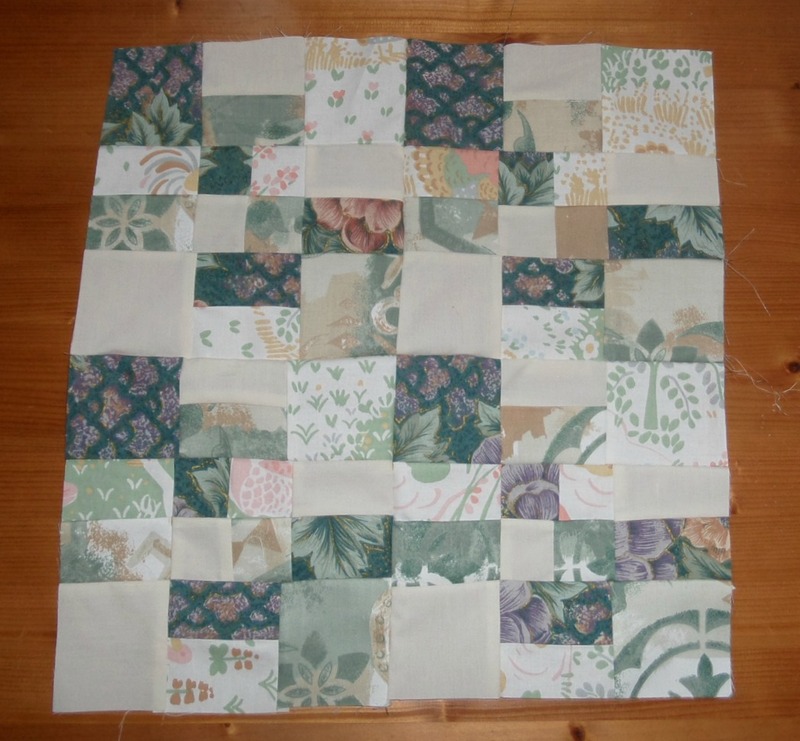 I started this week with what they call a nine patch - made from nine different squares of the same size. I was happy enough with the completed square and so have progressed onto to making four identical that I have sewn together to make a bigger square. The joy of this is there is no right or wrong with it, I can make it up as I go along in a way that I like the look of. Materials and colours can me matched or totally random. There are many many patterns out there, some look harder than they really are and others are too complex for me as a beginner. I managed to find a few books on amazon designed for beginners. I did not buy new ones but second hand from an online shop in the USA. One book cost me 5p, yes 5p, I have to wonder why they are even bothering to sell that as there is no profit at that price. I am still waiting for the books but they did say three to five weeks for delivery. But I got the three of them including the postage for cheaper than I could get one of them in this country so I am quite happy to wait. 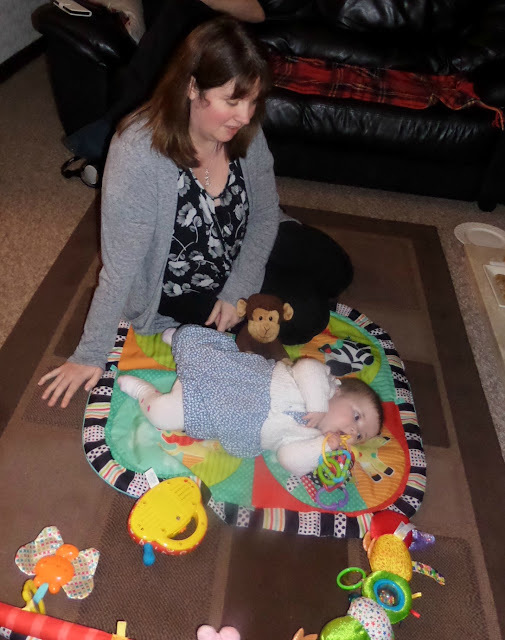 My name is Auntie Heather (otherwise known as DD3) and I'll be guest posting on the blog to add some variety and a different view of life with the children. I thought you all might like to know a little bit more about me so here goes. 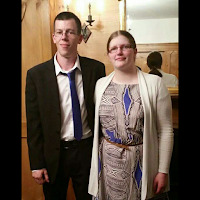 This is my other half Martin and myself. 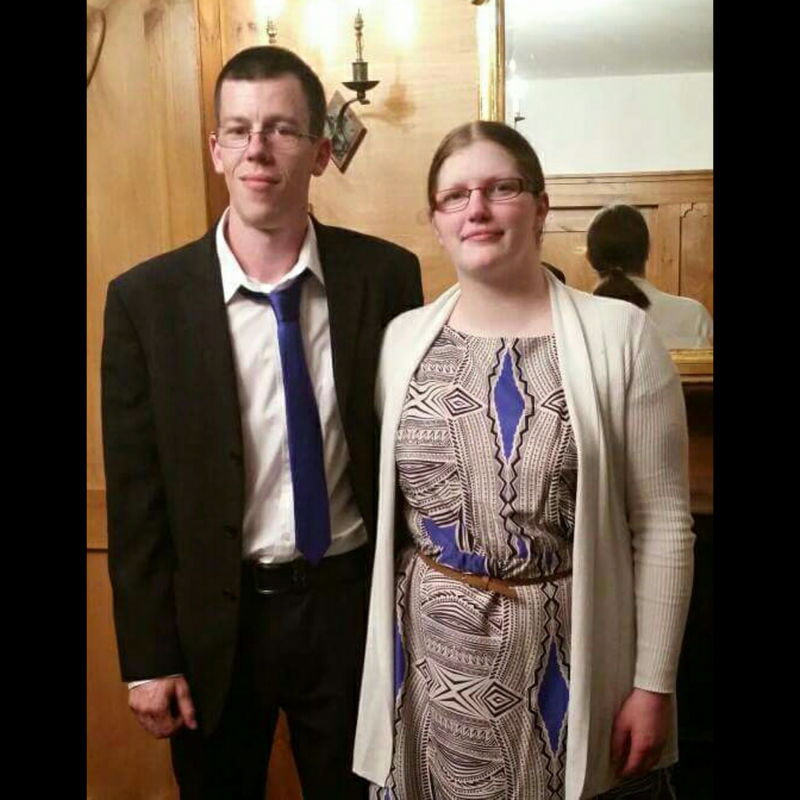 He is 27, I am 28 and we both live in the small village of Dalrymple in East Ayrshire. We have been together for 4 years and we live with his parents, his brother and his brother's other half. We also have a family dog named Zac. We live here as his parents very kindly offered me a place to stay whilst we save up to buy a house of our own. It's a busy household but we all get along well (for the most part lol) so it is good fun. I work for the NHS in an administrative capacity. I have been doing so for just over a year and it is fabulous, I enjoy my job immensely. Previously I worked for a large pizza chain for 5 years and a theatre for 6 years. I have had other jobs too but those were my main ones. I still volunteer at the theatre and attend classes on a weekly basis. I love to sing and I enjoy working backstage as a member of the Stage Crew team. Bob also attends the theatre each week to participate in a musical theatre class, and Fifi intends to join the Technical Theatre class when she has a bit more spare time. It is nice to be able to share this with them as music/theatre is a passion of mine and it is great to see them enjoy it too. Fifi spent a weekend volunteering to help with make up/facepainting during Bob's first big show and caught the bug. Dinky and Minky will soon be starting a class for the younger age groups too. Time will fly and I think Spud will end up there too, she loves when you sing to her and baby boogies to music when it is on. Uncle M is an auto-electrician for a large bus company, currently working permanent night-shift in Falkirk. He finds nights tough but enjoys his job all the same. We're hoping he gets day-shifts at some point as he feels he's missing out on a lot when having to sleep all day and part of the weekend. In my spare time I enjoy reading, singing, playing games and most of all spending time with my nieces and nephews (their parents too of course!) You will know about most of my nieces and nephews I see on a regular basis, I also have a 4 year old nephew K whom I don't see as much but planning to change this over the coming months as I'm missing spending time with him. I have a lot of step-family who have children, however I don't see them very often, we joke that it's only at Christmas and funerals as we all lead such busy lives. It is nice that we can always pick up where we left off though. I hope to post on a fairly regular basis about my time with the kids, special occasions, milestones and trips we take. 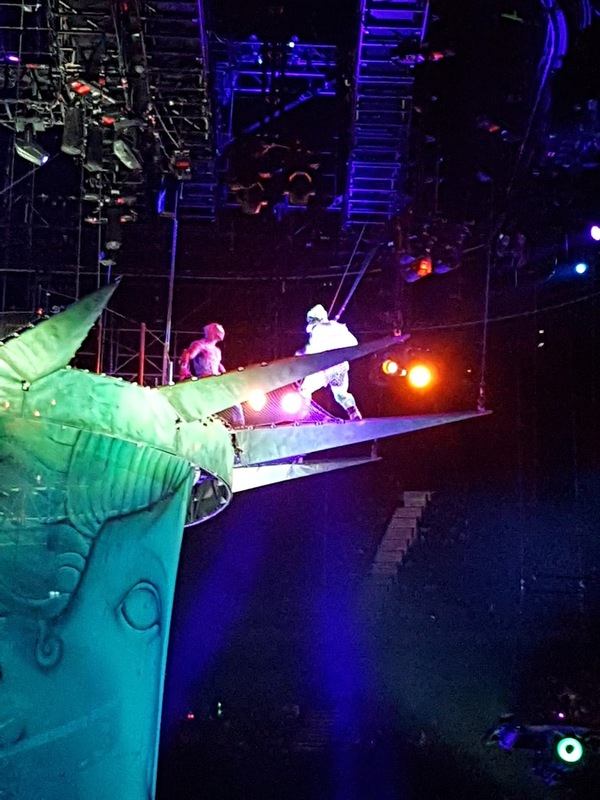 There may also be a few posts about working backstage in the theatre and taking part in shows.